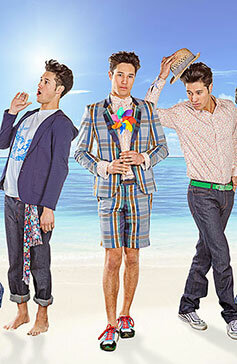 Win a Chameleon Blazer with M2 Mag! Here at MisteR we make everything in Limited Edition quantities and personally quality check each individual piece............this means we end up treating every garment like our first born! So giving away one of our jackets doesn't come easy, but when M2 Mag asked us to run a competition we had to say yes! Hell, they're NZ's best Mens Fashion Magazine! So enter now and you might be lucky enough to win some of our produce! Most of the time we just pretend to know what we're doing, but this latest piece of news proves otherwise. Red Eleven NZ's premier model agency has just signed up model Piri Bennett and its all because they saw him in our Summer Photoshoot! Yup, that's the images you've probably seen on our home page, Red Eleven loved them so much they signed Piri on the spot and put the images on their site! Not that we're Braggin or Nuthin! On a side note our Queen of hiphop Ladi6 is touring NZ with her new album, starting in Auckland on the 5/11. Ladi's own superstar Dj Mr Parks is an avid MisteR fan and will be reping us for sure! So make sure you get along and support us all. News, News and a touch more News! URBIS Magazine gave us a full page feature, which is on shelves now. 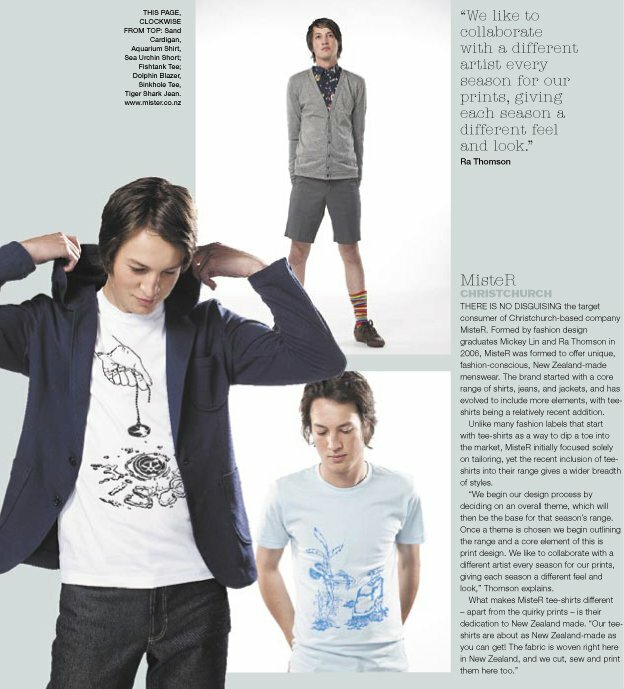 They had a good chat about our design approach to our t shirts and we think the article came out very nicely. Have a look! 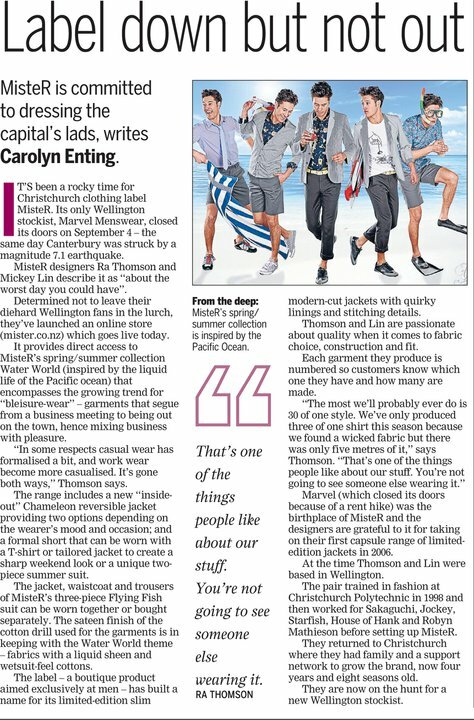 Then the Dominion Post featured us and our mission to dress the Capital's men and one lucky Wellingtonian is going to win a Dolphin Blazer... click here to have a gander. And finally, online fashion magazine Lucire also gave us a write up, annoucing the biggest news of the day - you can now buy our clothes online. That's right folks, you are a credit card and a couple of clicks away from owning a Blue Elephant Blazer and matching shorts which would look very fetching on you, if we do say so ourselves! Righto, back to the scissors and thread, talk soon. In 1995, Kevin Costner spent a veritable ton of money making one of the worst films of the 90s, which if you ask us is saying something. According to the IMDB, Water World won the Razzie for the Worst Supporting Actor (Dennis Hopper), and was nominated for Worst Director, Picture and Actor. It currently averages 5.7 out of 10. MisteR's Water World however looks to be one of the most promising menswear collections of the year. According to us, people wearing MisteR could be in the running for being Best Dressed Man of the Year, and possibly even Sunday Star Times' "Best Dressed Hearthrob" award. We think it will end up averaging a more than respectable 9.6 out of 10 at summer gatherings across our fair land. We love that whole social thing, but there's no substitute for having your very own home and we're incredibly happy to launch our brand new website to coincide with our Summer 2010/11 range hitting the shelves. Take your time and have a browse - go on, click a few things! You can see each and every piece of the Water World collection, read about about us, and of course we'll be keeping the site updated with news as it comes to hand. We've got plenty in store so if you're a MisteR fan subscribe to our newsletter and we'll send you interesting stuff… nothing spammy, we promise! Like our clothes, it's been a labour of love, forged during one of the odder periods of our lives - but that's enough about the earthquake! We hope you enjoy it as much as we do... Big thanks to Jono for making this happen, Lisa for the photos, Mel & Piri for the model talent, Shaun from Mods Hair on Colombo and all our friends who've helped out. It's NZ Fashion Week party people which brings out the bestest and brightest, not to mention some questionable taste and dubious choices! But Christchurch's own Mr Style doesn't put a foot wrong - if we do say so ourselves - rocking one hundred percent MisteR and looking splendiferous as always! Thanks Andhy and nice shot, Front Row Diary! 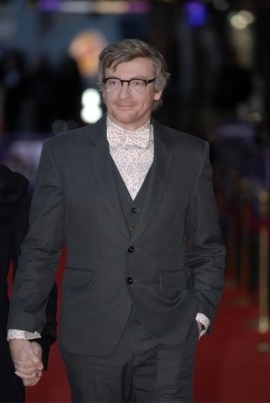 It couldn't be more Official, Rhys Darby is an international-type big time Kiwi success story. We know that he's really funny... but we now also know that Mr. Darby has unquestionably good taste and a sharp eye when it comes to suits. As the host of the 2010 Qantas Film and Television Awards the only thing that we hope has been seen more than Paul Henry's acceptance speech on YouTube is the fact that Rhys was wearing MisteR - one of our gorgeous suits with the Sea Anemone Shirt and Bow Tie from our latest Water World collection. It would be fair to say we're pretty happy with his choice, and perhaps style was the winner on the night? !